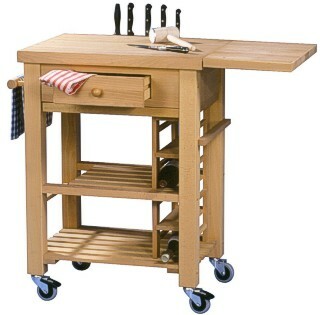 Superb quality kitchen trolley high crafted from beech with oiled beechwood worktop and hinged side board adding a further 30cm (12 inches) of usable work space. It has a fully enclosed knife block, a large pull-out drawer, removable pull-out board, a hand rail/towel rail, built-in 4 bottle wine rack and two built-in slatted shelves with space for bottles to stand upright. Oiled to preserve the natural appearance of the beech. It Stands on four wheels, two of which are lockable and its size is 73 1/2 by 54 by 89 cm high (29 by 21 1/2 by 35 inches approx) with the side board down. This trolley is delivered fully assembled.